CorbettJeepSafari.com Provides 4x4 Gypsy On Rent For Dhikala Zone, Bijrani Zone, Jhirna Zone, Dhela, Durgadevi Zone & Corbett Landscape Zone. Private vehicles are NOT allowed entry with tourists in Corbett Tiger Reserve. Registered safari vehicles can be hired by tourists from near Ramnagar Reception Office or Amdanda Gate. No advance booking facility is available for hiring of vehicles for visits to Corbett Tiger Reserve. We provide 4x4 Gypsy for Day Visit Safari, Night Stay with Safari and for pick-up & Drop. At CorbettJeepSafari.com by All Seasons India our focus is to provide you with a variety of car rental solutions in Corbett that best suits your needs at the cheapest prices we can find. CorbettJeepSafari.com offers real-time online booking everything from compact economy cars like Indica, Wagon-R, Alto to fullsize or luxury cars like Toyota Innova,Etios,Suzuki Dezire depending on your travel needs. All the cars we feature come fully equipped with the latest amenities and safety features that ensure your trips will be safe,convenient and comfortable. Car hire in Corbett has never been easier or as cheap. We offer competitive prices and up-to-date information, ensuring quality and efficiency for all our visitors, at all times. Rent a car in Corbett and enjoy your vacation, or get anywhere in time for your business meetings. We understand that travelling can be a hassle if you are not well organized, therefore we provide all types of cars to compare and choose from. Extremely economical yet reliable car hire in Corbett is now available at CorbettJeepSafari.com. Explore more today and get prepared for your trip to Corbett. Tourists can enjoy the best of Jim Corbett National Park by an exciting Gypsy Safari. Gypsy can be hired with a car rental in Corbett. There are many car rental agency in Corbett offering comprehensive range of cars to choose from. To make your travel in Corbett or for exciting Gypsy Safari in the park, we at Jim Corbett National Park offer a fleet of cars of all range to choose from. Tourists can Rent a car in Corbett with us and make their exciting jeep safari into the national park. Tourists can hire Taxi in Corbett with us and make tours and travels around the Jim Corbett in very convenient ways. We provide personalized Corbett car rental services and Corbett Taxi services at very competitive price to give you economical travel experience. Well, if you too want to explore the major attractions in and around Jim Corbett or want to make Gypsy Safari in the park, We at CorbettJeepSafari.com provides you excellent solution by offering car rentals in Jim Corbett. Book a car or jeep of your own choice and make your travel in Jim Corbett convenient.Corbett Car Rental also provides full infoemation about How to reach Corbett, reaching Corbett from kathgodam, Corbett by Bus, Corbett by road, Corbett by car,taxis, Driving directions to Corbett. Kathgodam to Corbett distance is just 103 kms. Looking for car hires for your upcoming trip? 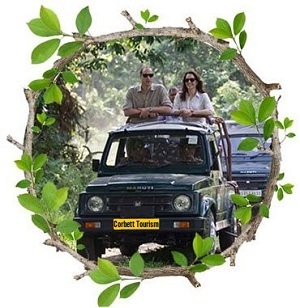 Whether it`s a business trip, casual trip or family holiday to Corbett, CorbettJeepSafari.com has you covered with its wide variety of cheap car rentals in all shapes and size. A simple search through our pages will give you the chance to choose the best car hire in Corbett at the most competitive prices you can find online, all in one place. Corbett National Park is the oldest national park in India and was established in 1936 as Hailey National Park to protect the endangered Bengal tiger. It is located in Nainital district of Uttarakhand and was named after Jim Corbett who played a key role in its establishment. The park was the first to come under the Project Tiger initiative..
Corbett Tiger Reserve © 2018 All rights reserved. | NOTE : We are private Corbett Tourism and Travels company. Promoting jungle safari, rooms reservation and other services in Corbett National Park and Near Corbett National Park. We are bound to follow the same rules and regulations which are directed by the Corbett Tiger Reserve and Government Of Uttarakhand.